Wednesday night Microsoft confirmed what we all expected—that it, too, has an activity tracker that it wants you to wear 24/7, for work and for play. It's called the Microsoft Band. Looking as much like a hospital bracelet as anything else, the $200 Microsoft Band features a rectangular, 320x106 TFT display that hovers over your wrist. Sensors—a continuous optical heart monitor, GPS, UV sensor, and more—track your activity while on the move and at rest, and send the data to what Microsoft calls the Intelligence Engine, aka Cortana’s little brother. The Band is designed to work with third-party apps, including MyFitnessPal, RunKeeper, and even Starbucks, which has developed a “payment” app of sorts. In all, Microsoft is calling the Band its flagship device of Microsoft Health, a reboot of sorts for a health initiative it tried to establish with products like HealthVault. If you choose, you can store the data the Band collects in HealthVault and share it with your medical provider. Otherwise, Microsoft sees the Band, and Health, as a new way to collect data about you that it can use to improve your day. Microsoft hopes its Microosft Band is equally adept for work and play. How? Initially, Microsoft sees the Intelligence Engine as supplying suggestions on how long to recover from a workout, for example. Over time, the Engine will apparently be able to comment on whether eating breakfast will make you run faster and more effectively. It’s unclear how the Engine will feed data into Cortana, but she’s there: You’ll be able to ask Microsoft’s digital assistant to add calendar entries, for example, or dictate a text. And, of course, the Band will notify you about upcoming appointments, as your Windows Phone already does. Why this matters: A number of fitness bands already track your activity, even sleep. Fewer still, though, deliver messages and calendar invites. And, barely any wearable platforms beyond those from the Big Three—Apple, Google, and now Microsoft—provide intelligence that helps you anticipate and plan your day. Microsoft’s Intelligence Engine and Cortana appear to be the pair of intelligent technologies that Microsoft hopes will inspire you to plunk down $200, rather than opt for the aesthetics of the Apple Watch or Google’s ecosystem. The Band isn’t Microsoft exclusive: Apps will allow it to work with Apple iPhones (the iPhone 4S, 5, 5C, 5S, 6, 6 Plus running iOS 7.1 or later), Android phone (4.3 or 4.4) and Windows Phones (with the Windows Phone 8.1 Update). Those apps leaked out earlier on Wednesday. 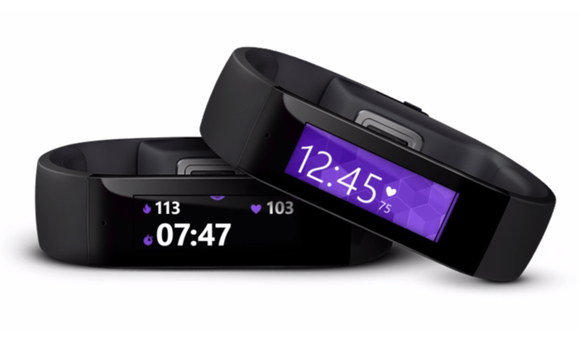 The Microsoft Band talks to Windows Phone, iOS, and Android. Microsoft promises that the Band will last about 48 hours on a single charge, with functions like GPS lowering that somewhat. It will charge in about an hour and a half. Unfortunately, it’s not waterproof, so swimmers will have to look elsewhere. But it will repel “splashes” and will work from 14 degrees up through 104 degrees. The Band includes an optical heart rate sensor, a 3-axis accelerometer, GPS, an ambient light sensor, a skin temperature sensor, an ultraviolet light sensor, a galvanic skin sensor, and a capacitive sensor. The watch will monitor your heart rate 24/7, and assess your sleeping patterns too. The band will record data on its own, then beam it to your phone via Bluetooth. It won’t make calls, but it will flash messages, emails, and even Facebook posts and Twitter tweets. And, of course, there’s a microphone, to trigger Cortana. There’s no speaker, however, so Cortana’s information will be passed along via the screen. 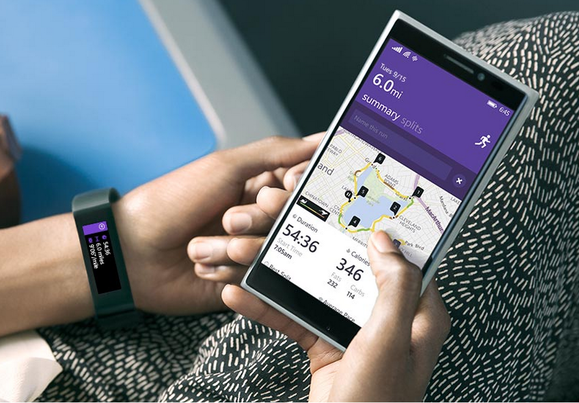 A small numer of app developers have signed on to support the Microsoft Band. Here is the Starbucks app. 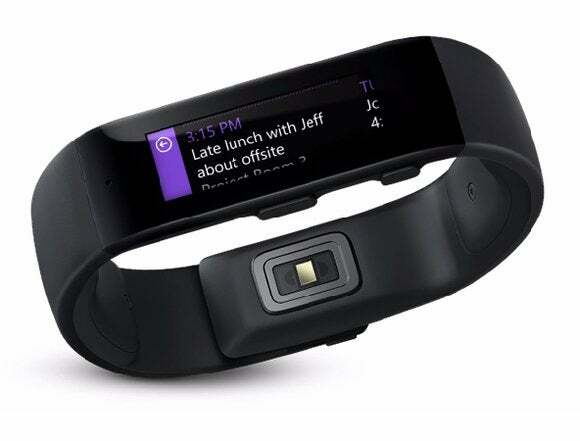 Microsoft seems to want you to wear the Band with the screen hovering over the inside of your wrist. Whether that’s a limitation of the sensors or a design aesthetic remains to be seen. Naturally, Microsoft hopes that the Band will become a platform, with third-party app developers coming together to add to its capabilities. In addition to the Starbucks app—you can tell the Band to display your Starbucks card info, which can be scanned—Microsoft has struck partnerships with MyFitnessPal, MapMyFitness, RunKeeper, and Gold’s Gym. Gold’s even will construct custom workouts, which Microsoft hopes the Band will be able to adapt as it learns more about you. All in all, you’ll find a lot of crossover between the features the Band offers and what other fitness bands and smartwatches offer. But the $200 Band is also available now, in three different sizes to fit different wrists. Microsoft also seems to be taking a page from Google in that it’s promising that the Band will improve over time, specifically as it learns more about you. With the Microsoft Band, Microsoft appears to want to play seriously in the health market, while also providing a tool for your workday. It remains to be seen, however, whether Microsoft will leverage its other technologies—its Xbox game console comes to mind—to enhance its capabilities further.